Drive is... One of the fastest growing major manufacturers and distributors of durable medical equipment in the home healthcare, medical/surgical and rehabilitation markets in the United States. We have manufacturing and distribution facilities located throughout the United States, as well as in the United Kingdom, Germany, China, Taiwan, Romania and Canada, and market our 2,500 products throughout the world. Our Mission... Is to manufacture and market world class products which focus on innovation, functionality and value to improve the quality of life and to promote independence for the individuals that use our products. 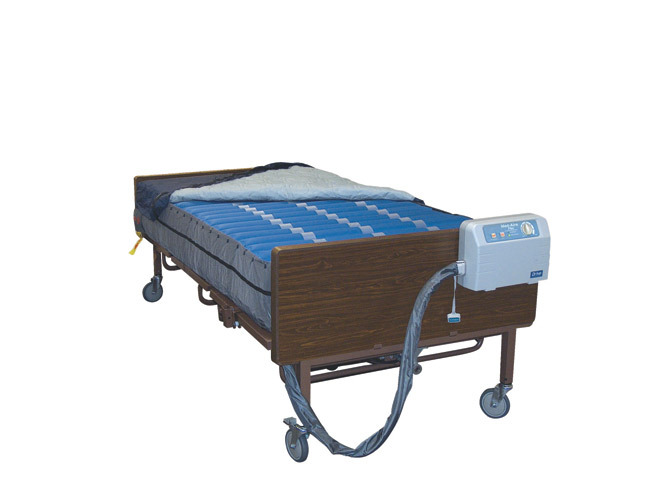 Unique construction allows for efficient air flow throughout mattress for use in the treatment and prevention of pressure sores. Easy to clean with mild detergent. 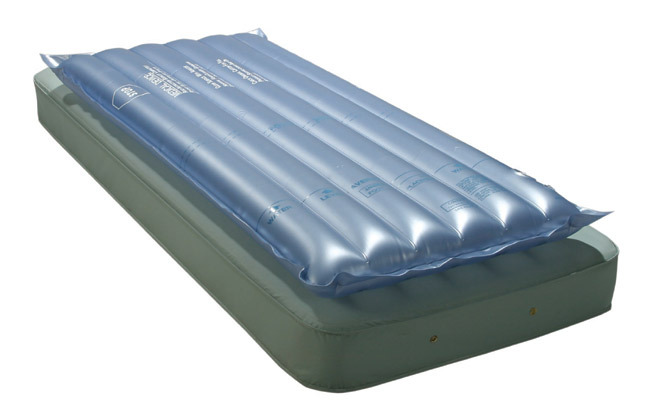 Emergency air release valve deflates mattress quickly and safely. Air flow holes reduce heat and fluid build up. 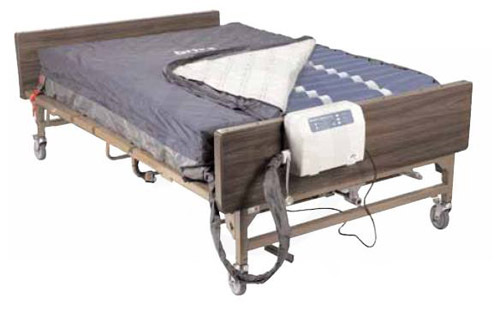 Adjustable bed straps prevent mattress from moving. 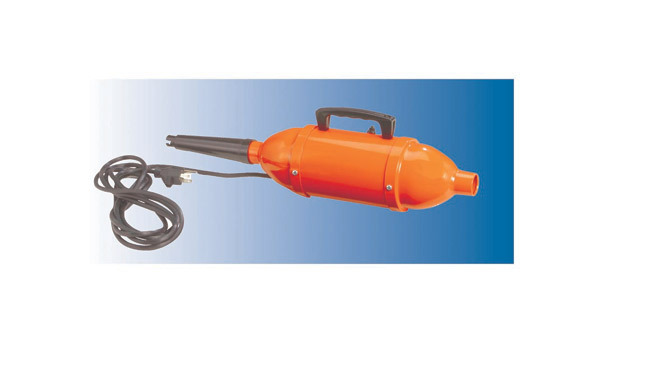 Two adapters for easy filling and air removal. Size: 72 x 35. Warranty: 90 Days.Width 35. Depth 72. Height 3. Product Weight 8 lbs.Carton Shipping Weight 11 lbs. Drive is... One of the fastest growing major manufacturers and distributors of durable medical equipment in the home healthcare, medical/surgical and rehabilitation markets in the United States. We have manufacturing and distribution facilities located throughout the United States, as well as in the United Kingdom, Germany, China, Taiwan, Romania and Canada, and market our 2,500 products throughout the world. Our Mission... Is to manufacture and market world class products which focus on innovation, functionality and value to improve the quality of life and to promote independence for the individuals that use our products. The new and improved Drive Medical Premium Guard Gel Foam Overlay optimizes pressure redistribution and comfort in the prevention treatment and management of pressure ulcers. The new design ideally combines 3 gel bladders high density foam shell and a vinyl support base. The improved design decreases the migration of the gel layer so patient wont bottom out and the convoluted egg crate foam top layer provides vastly improved comfort. Premium Guard Gel Foam Overlay. 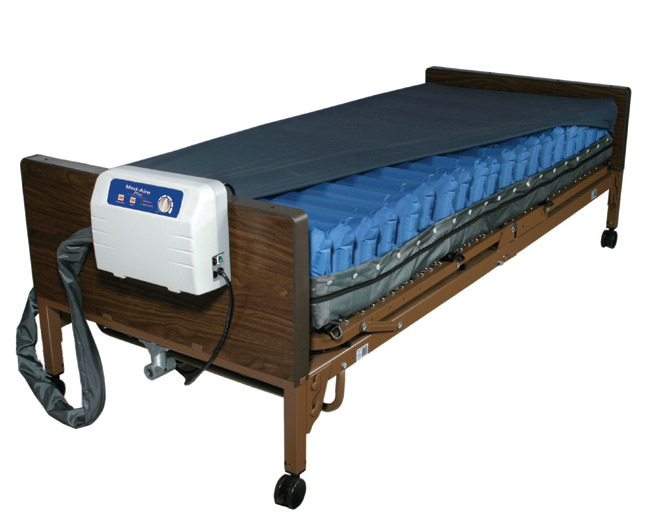 .The Air Mattress Overlay Support Surface by Drive Medical's unique construction allows for efficient air flow throughout the mattress for use in the treatment and prevention of pressure ulcers. The air flow holes in the mattress, reduce heat and fluid build up, ensuring that the affected areas remain well ventilated and dry for proper healing. 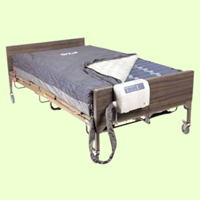 The adjustable bed straps prevent the mattress from moving and ensuring user safety and comfort. 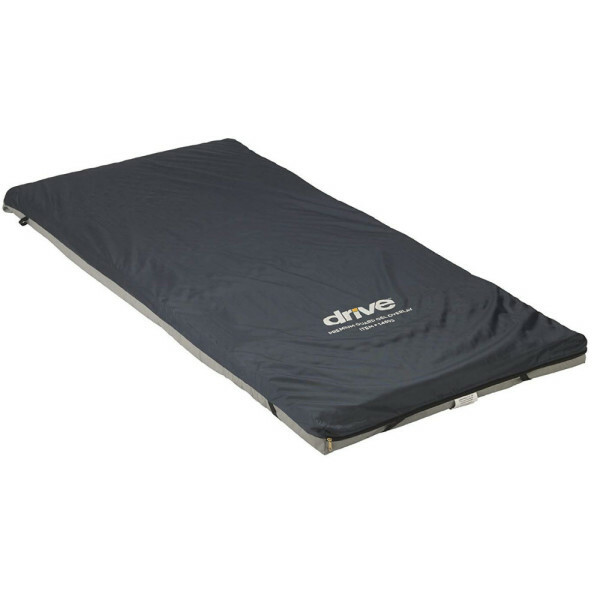 The Drive Medical Quick N Easy Comfort Mattress features innovative super compression technology that allows it to fit in a 37.5 x 14 x 14 box. This super-compact shipping carton is easy to carry and frees up space in delivery vehicles and warehouses. The Quick N Easy Comfort Mattress offers the utmost in comfort safety and convenience. Its inner core is encased in fire retardant barrier meeting regulation 16 CFR 1633. 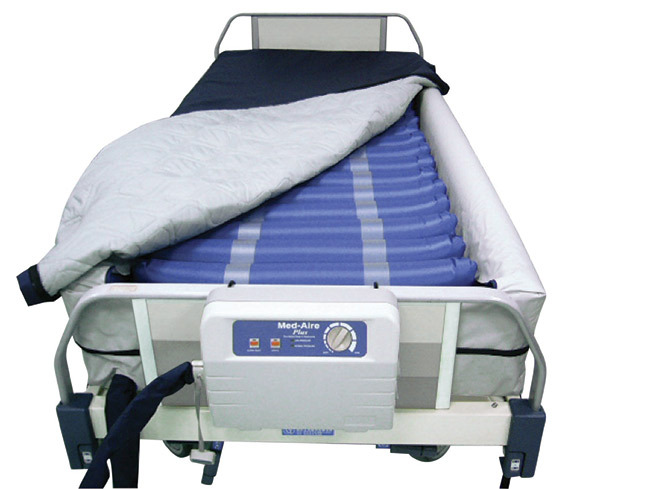 A non-slip bottom and 4 corner straps keep the mattress securely in place. Two carry handles on the side make lifting and placement easier. This premium seat rizer by Drive Medical is the perfect addition to any standard toilet. It includes removable arms that are molded into the rizer but can be removed without a hassle. The arms feature rubberized grips for added comfort and provide support while standing up or sitting down. The composite construction gives the rizer a contemporary look without skimping on durability. For consumers using a wheelchair tool free removable arms allow for easy transfer to and from the raised toilet seat. The product easily attaches to any standard toilet without tools. Seat dimensions: 14 W x 19 D x 3.5 H; Width between Arms: 19. Pressure reducing cushion designed to assist in the prevention treatment and management of pressure ulcers. Viscous Gel provides optimized pressure reduction support and comfort. Fire Retardant polyurethane foam shell. Removable and replaceable cover has water resistant Top and Non-Slip vinyl base. Drive is... One of the fastest growing major manufacturers and distributors of durable medical equipment in the home healthcare, medical/surgical and rehabilitation markets in the United States. We have manufacturing and distribution facilities located throughout the United States, as well as in the United Kingdom, Germany, China, Taiwan, Romania and Canada, and market our 2,500 products throughout the world. Our Mission... Is to manufacture and market world class products which focus on innovation, functionality and value to improve the quality of life and to promote independence for the individuals that use our products. The new Drive Medical Premium Series Bath Bench with Back and Arms is designed for individuals who require additional safety measures with balance in the bath or shower. The seat fits all shapes and sizes and the lightweight design has large stable legs with soft non-slip feet ensuring user safety. This bath bench has tool free height adjustment and tool free back leg and arm removal as well. Drive is... One of the fastest growing major manufacturers and distributors of durable medical equipment in the home healthcare, medical/surgical and rehabilitation markets in the United States. We have manufacturing and distribution facilities located throughout the United States, as well as in the United Kingdom, Germany, China, Taiwan, Romania and Canada, and market our 2,500 products throughout the world. Our Mission... Is to manufacture and market world class products which focus on innovation, functionality and value to improve the quality of life and to promote independence for the individuals that use our products. Over 240 air cells and chambers self-adjust for pressure equalization. Three layer system adjusts to evenly distribute air volume. Heavy duty gauge vinyl provides maximum air loss protection. Easy to clean with mild detergent. Four heavy-duty elastic bed straps prevent mattress from moving. 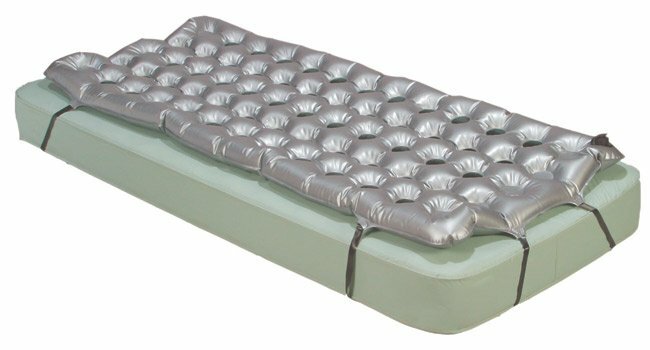 Emergency air release valve deflates mattress quickly and safely. Compatible with most air filling devices. Size: 72 x 35. Warranty: 90 days. Drive is... One of the fastest growing major manufacturers and distributors of durable medical equipment in the home healthcare, medical/surgical and rehabilitation markets in the United States. We have manufacturing and distribution facilities located throughout the United States, as well as in the United Kingdom, Germany, China, Taiwan, Romania and Canada, and market our 2,500 products throughout the world. Our Mission... Is to manufacture and market world class products which focus on innovation, functionality and value to improve the quality of life and to promote independence for the individuals that use our products. Three water baffles enhance movement and support to reduce pressure and conform to varying body weights. Filling lines and Foot Placement lines provide for proper patient positioning. Double sealed seams provide maximum strength and durability. Vinyl construction is durable and easy to clean with mild detergent. Fill lines are conveniently located. Size: 68 x 32. Warranty: 90 Days.Width 32. Depth 68. Height 4. Product Weight 4 lbs.Carton Shipping Weight 6 lbs.